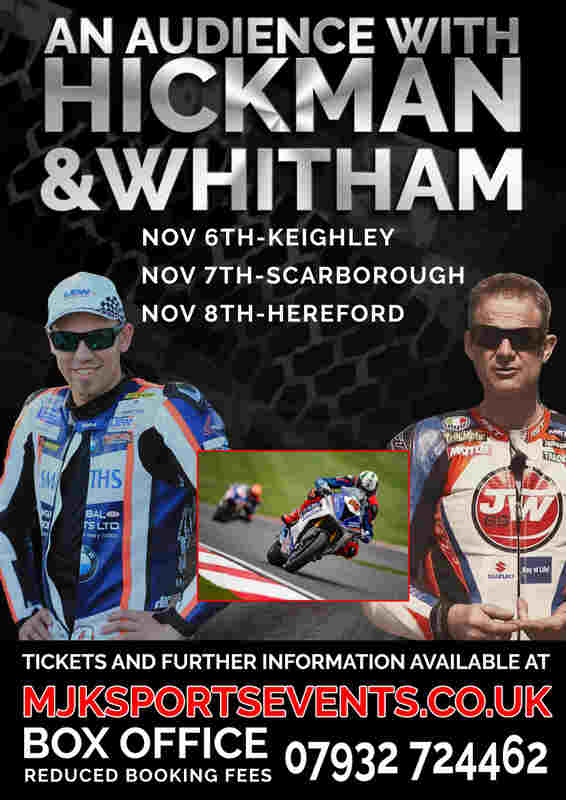 AUDIENCE with PETER HICKMAN and JAMES WHITHAM. unique chance to hear everything from the man himself. A 2 Time winner at the TT, many good judges see him as the next TT SUPERSTAR. The current lap record holder at the TT with an unbelievable 135mph lap HICKY also regularly races at the front end of the BSB championship. He likes a bit of banter and suits our events and also our host perfectly. A successful racer in his own right WHIT now works in the media and although we say so ourselves the man is simply brilliant. We have worked together for many years and the style and banter in his interviews is a joy to behold for fans of motor cycle racing. This format is very successful, the events are delivered exactly as billed with no gimmicks and no nonsense and it suits James down to the ground. He has the benefit of racing at the TT and as always will interject with his own hilarious stories.